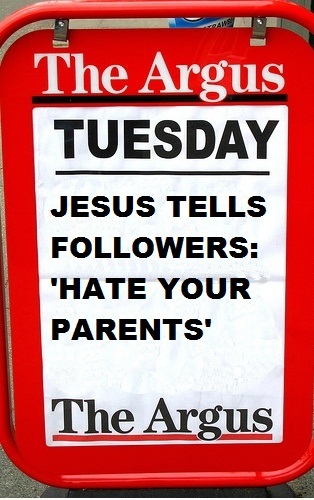 Heroic, roving reporter Bill Gardner left a Catholic Church in shock yesterday when during the Gospel reading Jesus told his followers to hate their parents, husbands and wives and that if they wouldn't do that found it so irritating that he hated them. The controversial rabbi, who is said to have died around 33 A.D is known for making extraordinary claims about his divinity and has also been known to make sensational, headline grabbing statements in the past, at different times in the Church's liturgical year. "I knew I had my story! 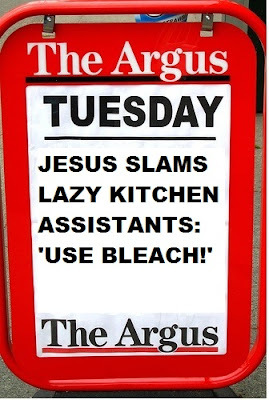 I heard enough and I stand by my article in The Argus. You may say that I haven't got the full story or that I've deliberately written it to get another controversial Jesus story into the nationals. You may even say that I've misrepresented the rabbi or that I've deliberately twisted it to make him look bad or uncaring, but I stand by what I've said. After all, I'm quoting the man himself." This is not the first time the controversial rabbi has been in hot water due to articles in The Argus. 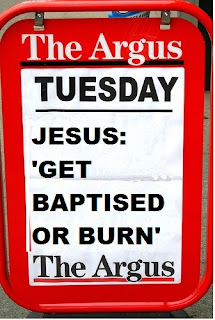 Last year, religious controversy correspondent Bill Gardner was present at another Mass in which self-proclaimed messiah, Jesus, told his followers to be baptised and that if they didn't get baptised that they 'would not see the Kingdom of God'. 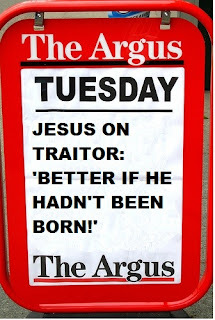 The story for The Argus attracted interest in the national daily newspapers and quickly flashed across the globe as newspaper agencies and media pundits tried to wrap their heads around the sayings of Christ. Again, Mr Gardner responded: "No, I did not hang around to hear a lengthy explanation of the Church's emphasis on the importance of Baptism in the life of the Christian, but I knew I had my story and, having pocketed quite a bit of cash out of the article, was happy with what I had written." The news comes hard on the heels of reports last year that during a liturgical service at one local Catholic Church, the same rabbi had said shocking things about his enemy, named Judas, who he trusted but who betrayed him just to get a bit of extra cash while feigning care and concern for the poor in order to raise his own profile. 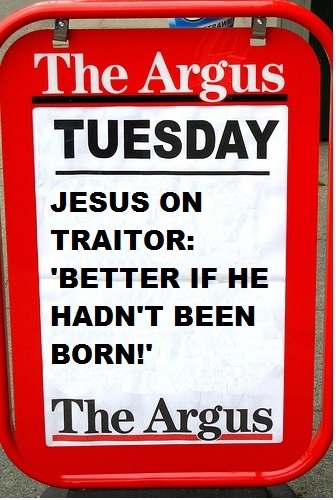 Jesus branded him a traitor, even questioning whether his birth was worth it in the long run. "It would be better for that man if he had never been born." This story, covered by the same Gardner, however, was revealed not to be in any way misleading, with leading media pundits suggesting that the rabbi's traitor may indeed have gone to one of the worst places in Hell for all eternity, though it is the Church's position that we'll only know that for absolutely sure when after we're dead. Lukewarm: The temperature Jesus hates! It literally makes him sick! Do you want to be Jesus's vomit? 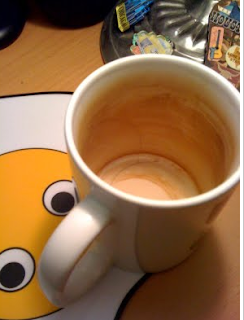 Then take either hot or cold showers, have tea hot or cold, NEVER lukewarm! Many of Jesus's most controversial statements have centred on his passion, death and his low-key resurrection from the dead. These controversial statements are well known and have earned the rabbi much negative publicity in the past. However, religious correspondent Bill Gardner was also present in the congregation of a local Catholic Church when Jesus, still with many followers in 'godless' Brighton, promised to vomit an entire congregation out of his mouth in the Book of Revelation. 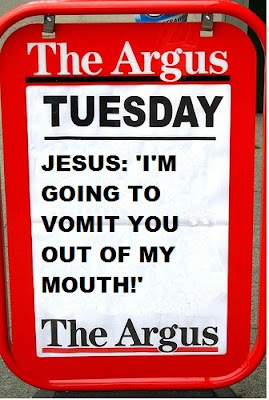 In his Argus exclusive, Bill Gardner questioned whether it is possible to vomit anyone out of our mouths, he himself only having vomited slander against priests and also questioned whether this was a just punishment, merely for the sake of one's tea drinking temperature habits, or because his followers like their shower temperatures to be around 5 or 6, rather than a sizzling 9 or freezing 1. Gardner's piece, which went into The Daily Mail, The Telegraph and The Sun, did much to damage the reputation of the redeemer but Gardner escaped without being sued again, just weeks after he was accused of distorting the Lord's words to the Pharisees about purity of heart. Gardner ran an exclusive on the controversial Christ's stunning warning to followers across the world highlighting his obsession over crockery cleanliness. 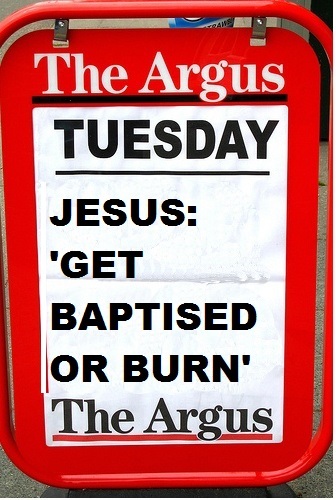 I have several times tried to access the 'Argus' website this morning without success. The green thingy just keeps on going round and round and the page remains blank. What bliss! Dare I hope that this site has vanished forever? Bones, you are a star! Laughed so much I cried. I commend your talent. You know what to do - I'll spot you the necessary if need be. Excellent, Lawrence. You have really excelled yourself!.